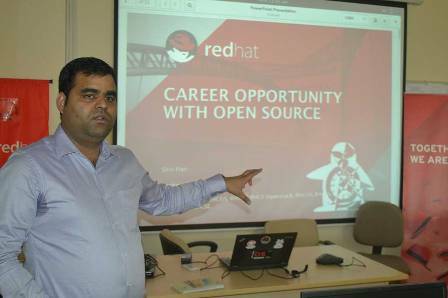 The Red Hat Academy has been inaugurated at the Institute of Engineering and Technology, J.K. Lakshmipat University, Jaipur. 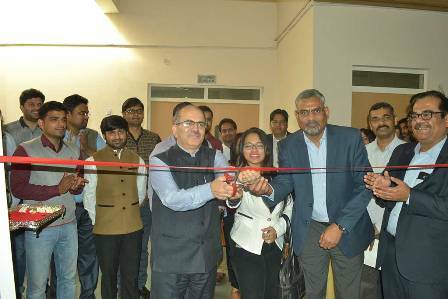 The Red Hat Academy has been inaugurated at the Institute of Engineering and Technology, J.K. Lakshmipat University, Jaipur. The inauguration was done by the Dr. Roshan Lal Raina, Vice Chancellor and Prof. Dr.-Ing. Anupam Kumar Singh, Director, Institute of Engineering and Technology at the J.K. Lakshmipat university campus on 20th February 2017. The Red Hat program aims at enhancing technical skills for engineering students. Students would be benefitted by training leading to industry driven certifications. Ms. Rani Patil, Business Development Manager, Red Hat India delivered key note address and Mr. Shiv Hari, Learning & Development Instructor, Red Hat India conducted a technical session for the students of Electronics & Communication and Computer Science Engineering branches. The sessions were co-ordinated by Dr. Sonal Jain, Head-Computer Science, Dr. S.S. Sengar, Head-Electronics & Communication of Institute of Engineering and Technology. The function drew enthusiastic and interactive response from the undergraduate students. Disclaimer: The information provided in this Notification is solely by J.K. Lakshmipat University., Jagranjosh.com bears no representations or warranties of any kind, express or implied, about the completeness, accuracy, reliability, suitability or availability with respect to the information. Individuals are therefore suggested to check the authenticity of the information.